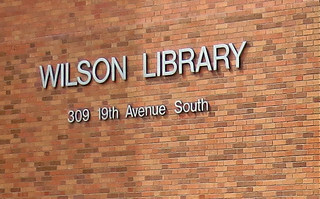 I spent some time over at the University of Minnesota's Wilson Library today, doing research for my computer history book. Burroughs Corporation grew out of the adding machine company that was founded by William S. Burroughs (grandfather of the beat-generation author of the same name) in St. Louis, Missouri. The company was originally called American Arithmometer and was one of the all-time great investment opportunities of all time. What I thought was going to be a short chapter on the early history of the company has turned into a multi-year obsession as I have chased down the early history of the company. One major turn of events occurred in 1901 when there was a fierce battle for control of the company waged between two factions, one of them the three Langhorne brothers of Salem, Virginia. The financial power in this family was James C. Langhorne. J.C., as he was known had accumulated substantial wealth in the silver mines around Leadville, Colorado. He invested in a number of businesses and real estate in his home town of Salem in addition to buying into American Arithmometer. I have been looking for a picture of the Langhorne flour mill for a long time. I had this ad for Langhorne's flour and there are lot of references to the mill - it was a major landmark at the western edge of Salem. 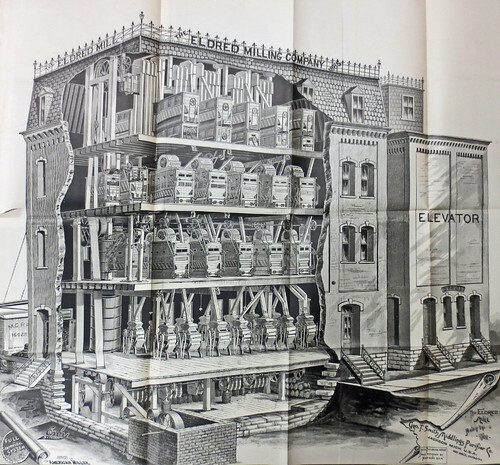 But I finally located a reference to the mill's major reconstruction during 1885. There was supposed to be a photograph of it in the September issue of American Miller. 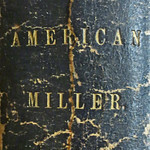 Now - where to find a copy of American Miller from 1885? Luckily, we reside in The Mill City. A quick check of the University of Minnesota library catalog showed me that they held American Miller beginning with 1873. 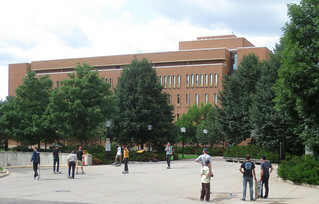 I headed for Wilson Library, passing the skateboarders and descended into the sub-basement annex. 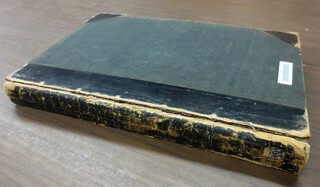 A librarian quickly pulled the 1885 bound volume of the Miller for me. The American Miller was one of an amazing number of trade magazines published in the late 1800s. 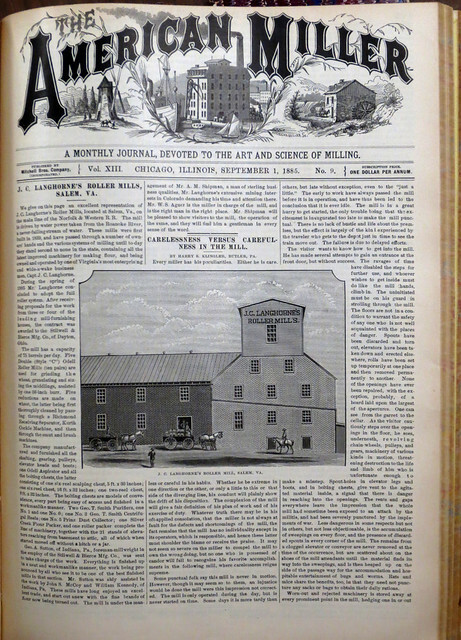 Each month, there was a fifty-page edition with flour mill news from around the country including new construction, fires, accidents and lots of advertising for the tools of the trade. For a dollar a year, this was quite a magazine. And they even featured a page of people writing in to tell them that each month. 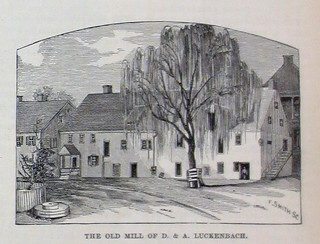 And there, on page 443, was the picture with the story of J. C.'s mill. 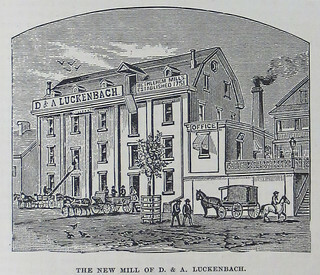 David and Andrew Luckenbach of Bethlehem, Pennsylvania, had this old and new mill featured in the October issue. 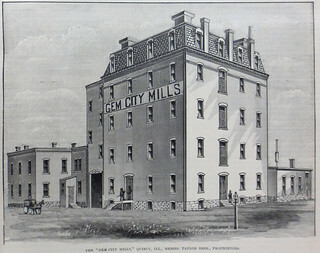 The Taylor brothers owned this mill shown in the December issue. It was in Quincy, Illinois. 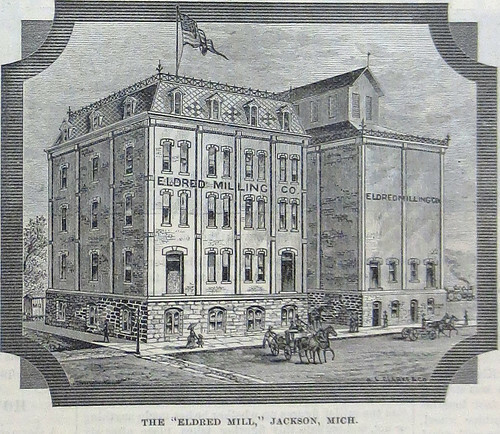 But the real gem of 1885 is this large mill in Jackson, Michigan. Owned by Z. C. Eldred and George T. Smith. It was featured on the cover of the November issue. 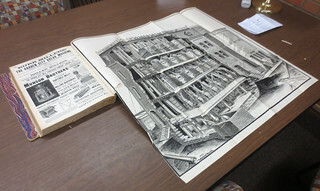 And then, in December it appeared again in this super-sized foldout. Where on Earth Are the Sawyers? 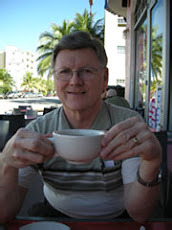 I've been asked a couple of times recently why our travel blog seems stuck on April. It has been almost four months since I posted anything so I had better do an update. and yet I know lots of people who wouldn't hesitate to attend a convention or baseball game in Chicago. ... el-Sissi asked ministers to be in their offices by 7 a.m. each work day. 7 a.m.? Anyone that knows Egyptian bureacracy will recognize that as real change. Next, the government raised the price of gasoline and other auto fuels from 40 to 175 percent. Whoa! 175 percent? Well, that was the special case of the natural gas powered vehicles. My last post on gas prices was here. And don't get too sympathetic toward the residents. The low grade gasoline (80 octane) only went up from 49 cents per gallon to about 85 cents per gallon. I am anxious to get back to Egypt this winter and see how that was received. Electricity is still in short supply. (The government raised the price of that heavily subsidized commodity too.) This recent article in the Egypt Independent features a photo of barbering by candlelight. If you are interested in an update on more of what has happened in the area since the "Arab Spring," this report from Michael Totten gives an excellent picture.